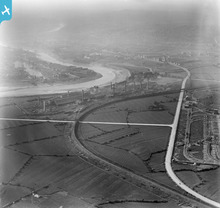 [WPW000946] View of Orb steelworks, Newport, oblique aerial view. 5"x4" black and white glass plate negative. 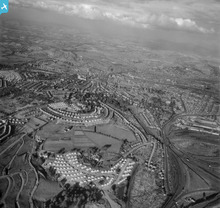 [WPW029303] View of Newport showing expanse of town, oblique aerial view. 5"x4" black and white glass plate negative. 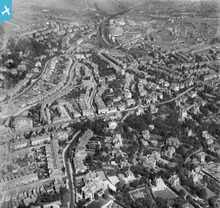 A detailed aerial view of the Stow Hill area of Newport in 1929.